The Retired and Senior Volunteer Program (RSVP) of Oakland and Macomb Counties recently gathered in an effort to show their appreciation for those in the military. 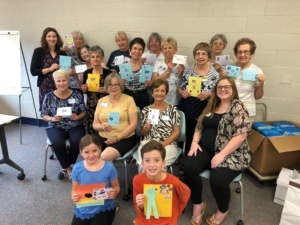 The group, comprised mostly of family members of military veterans, gathered August 1 to write cards and letters of appreciation to active and veteran US military personnel. One RSVP volunteer, Barbara Sparks of Ray Twp., is a veteran who served on active duty for 11 years. Space for this event was generously donated by Macomb Community Action Family Resource Building in Mt. Clemens. Cards created were mailed to “A Million Thanks” for distribution. More information about this military support organization is available here. RSVP is a free program which places adults age 55 or older in a variety of meaningful volunteer opportunities in their local communities. Approximately 7,000 Senior Corps volunteers participate across Michigan, volunteering in schools and hospitals, assisting the homebound, veterans, food pantries, and more. “Knowing a volunteer’s interests and abilities allows us to customize our suggestions for them, ” said Trista. To learn more, please contact her at johnsont@ccsem.org or 248-559-1147 ext. 3941. RSVP is sponsored locally by Catholic Charities of Southeast Michigan and is a program of the Corporation for National and Community Service (CNCS), the federal agency for volunteering, service and civic engagement. CNCS engages millions of Americans in citizen service through its AmeriCorps and Senior Corps programs and leads the nation’s volunteer and service efforts. For more information visit nationalservice.gov. RSVP is funded by CNCS, the Michigan Aging and Adult Services Agency, and financial support from the community.